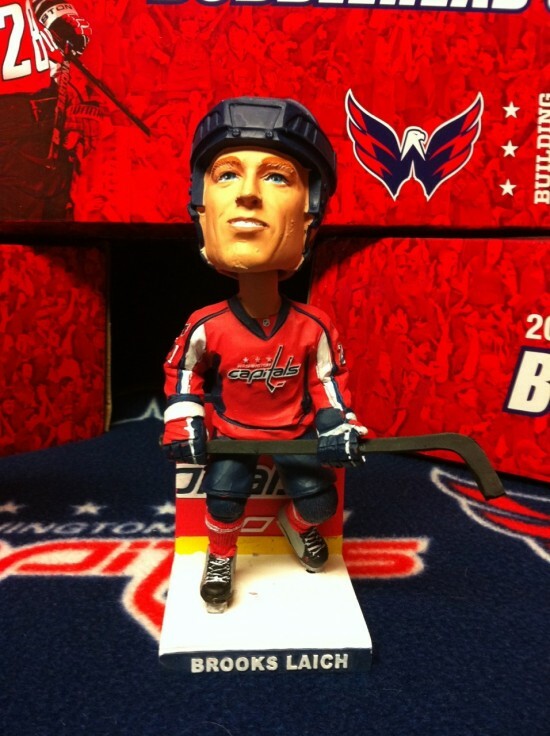 Got any Capitals bobbleheads? Or did they all break during the earthquake? Either way, there are six – yes SIX – new ones out, but they are only available for season ticket holders. 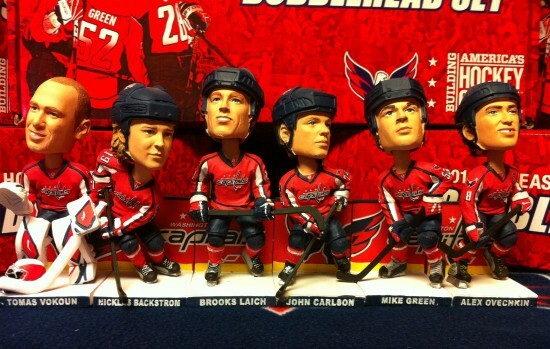 This year’s season ticket holder gift includes Tomas Vokoun, Nicklas Backstrom, Brooks Laich, John Carlson, Mike Green and Alex Ovechkin. 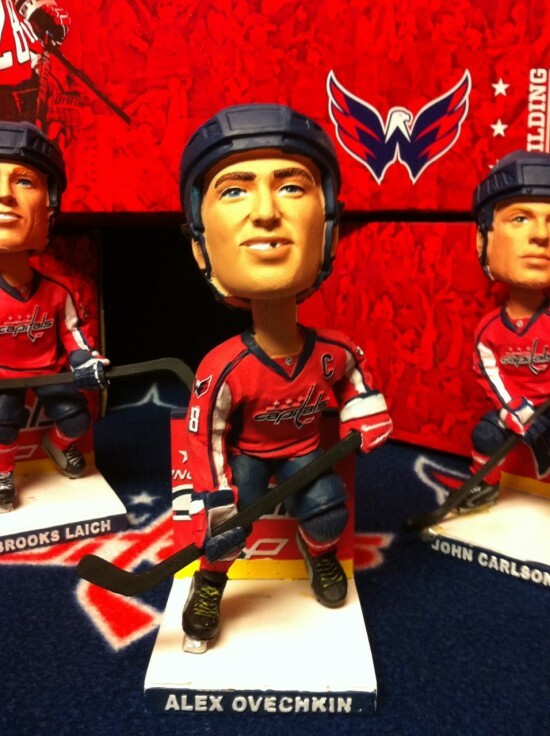 With approximately 7,000 sets made, and six per pack, that’s about 42,000 Capitals bobbleheads that are now wobbling on mantles across the Washington area. A project this big was not without its challenges. Getting six of these packaged properly and shipped from China to L.A. to D.C. had the potential of being a bobbling disaster. The Caps also had to give themselves plenty of time to prepare, so the project started in June when it still wasn’t certain who would be on the team. 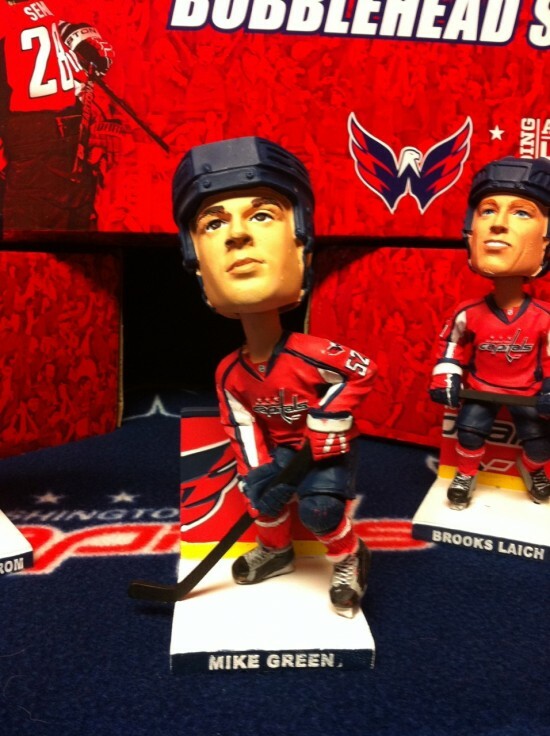 Once Laich signed, he joined the mix. 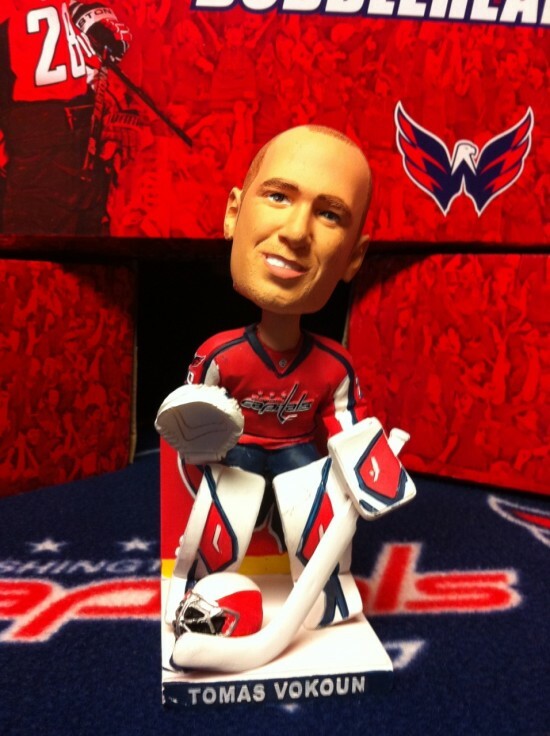 The Capitals also picked newly-signed Vokoun, who at the time was the obvious starter. 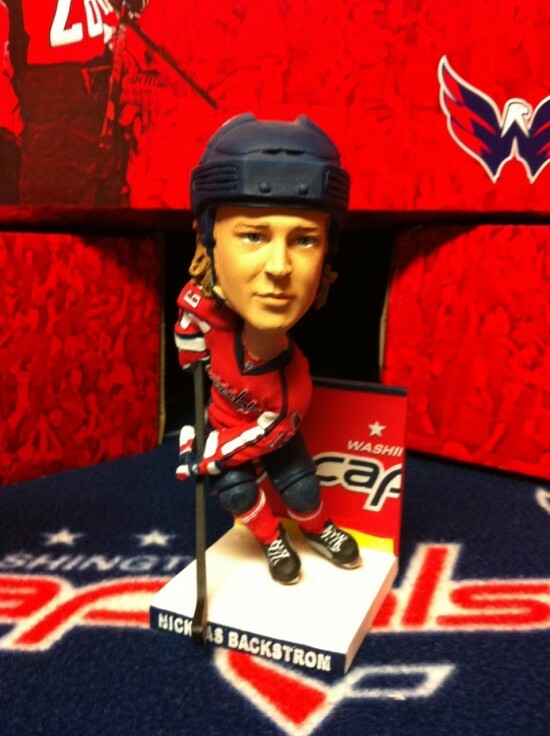 Don’t feel bad for Michal Neuvirth, though, since he had the honor of being immortalized with a far rarer (thus more valuable) Inova Blood Drive bobblehead. Season ticket holders had the option to order more sets for an extra $35 each. Assuming other season ticket holders feel the same way, this creates an opportunity for collectors who want to get their hands on these. Listings on eBay currently range between $100 and $200. 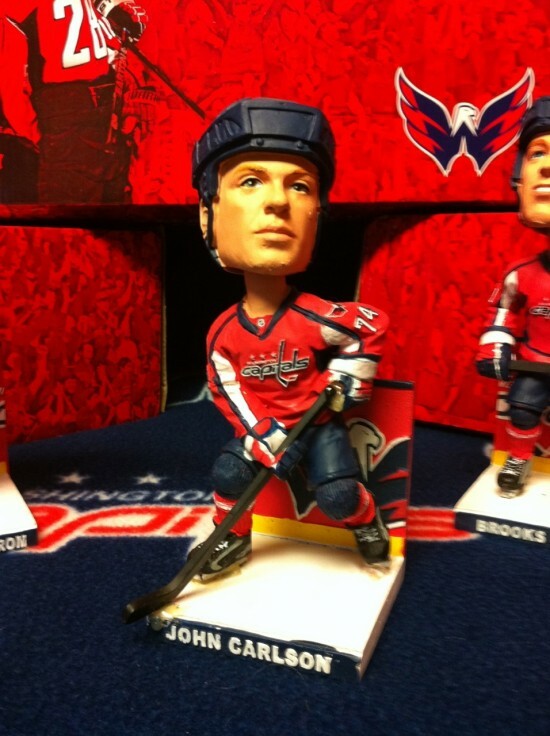 Because of this project, there won’t be any more bobbleheads given out this year, except at the next Inova Blood Drive in March. The Capitals haven’t yet announced which player it will be, but I’m putting my money on Karl Alzner. Enjoy more photos of these, courtesy of season ticket holder Toni Trombecky.